Autolock always worked fine in version 5 desktop, but it's not locking in version 6. The only option that I always have unticked is Settings > Security > Autolock When: "Main Windows Is Closed". Those settings worked fine in version 5, but not in version 6. Sorry for inconvenience. 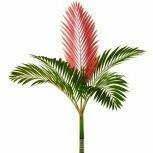 Please share your OS details (Desktop Environment too if using Linux) with us. I am just doing some more testing as I didn't realize that the desktop and Windows Store versions operate separately. A bit confusing. Edit: It's still not working, regardless of the 2 different versions. Both versions fail to lock. It appears that the "System Inactive" setting is not working. The feature was removed in v6. In my opinion, it's a huge setback and a huge SECURITY issue. I was horrified when I went to my system tray to open Enpass and I was already logged in! I mean, you can't remove such a key feature just like that, especially when people have had this setting configured for ages and are used to the application locking itself after being inactive for X amount of time. Many people might not even find out about this for some time, leaving their account data potentially exposed to anyone else who -even by chance- opens the application. Enpass Team, please do right by your users and fix this security issue. Who said it was removed? How come the options are still there in settings? 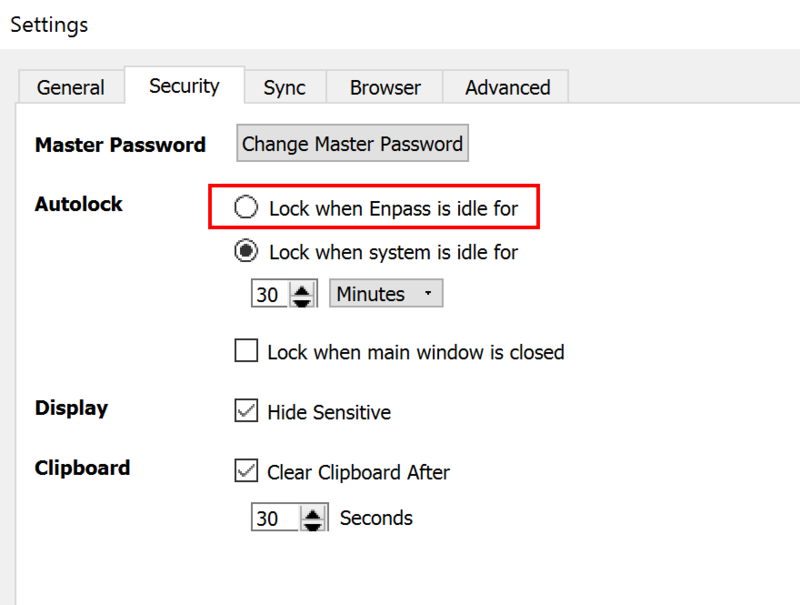 I rely on Enpass locking after X amount of time? I'm not liking what I see in v6. Take a look at the security settings on new version vs. previous version (attached). It's there. You have it set to 1 minute on v6. Have a look at the "Autolock When" settings. It's the last one. But it's not working for me. Could you please change the "Minute" into "Seconds"? Or let the user choose, like it was in the old version. It's there. You have it set to 1 minute on v6. 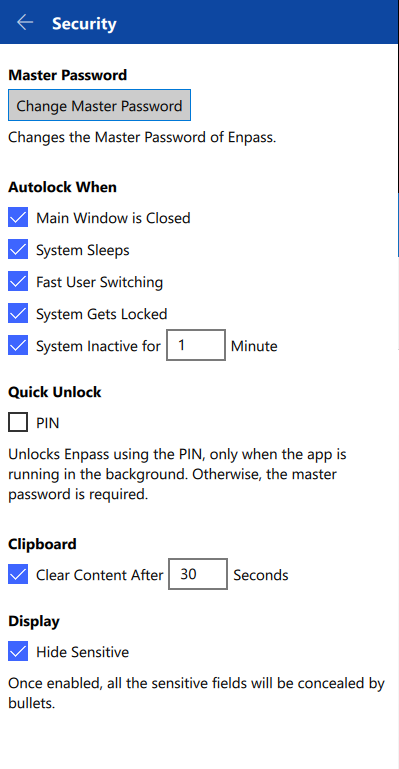 Have a look at the "Autolock When"﻿ settings﻿. It's t﻿he last one. Note that the "Autolock when System inactive for X minutes" is not the same as "Autolock when Enpass is idle for X minutes". The latter is missing on the newest Enpass version. Oh. yeah. I guess that's why it's not working for me.